We continue to celebrate National PT Month by highlighting special patient stories. This one comes from Lori, who suffered an ankle injury and sought care at our Gonzales location. "My life was forever changed when I broke my ankle on vacation in July 2017 while on vacation in the mountains of Tennessee. Upon my return home, I was required to have surgery to have plates and screws put in. I lost my mobility and independence in the blink of an eye!! Needless to say, my life and career as a middle school principal were greatly affected, and I knew that in order to regain my independence, I required the expertise and care of an excellent physical therapist who would provide the best treatment possible. When the doctor asked what physical therapist I wished to work with, I knew without a doubt from past experience that Gus Gutierrez was the physical therapist who would give me my life back!! 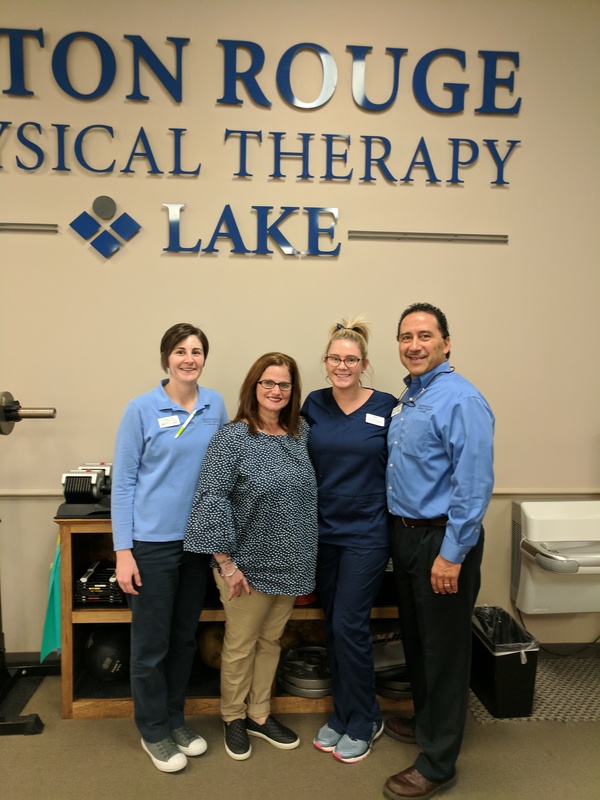 My 9-week journey to regain mobility and independence with the staff of BRPT Lake has been such a positive experience!! Gus, Ashley, and Shelby, along with all of the other wonderful staff, have been my biggest cheerleaders and supporters, especially when I didn’t believe in my own ability to learn how to walk again and struggled because of pain!! Their caring, compassionate interactions with me, as well as the various exercises and Astym therapy each week, have helped me to slowly but surely regain my confidence and independence and have made my feelings of helplessness disappear!! Although I still have more work to do to recover fully, I am well on my way to reaching my goal!! I am forever grateful to my phenomenal therapist Gus and the staff of BRPT Lake!!" (L to R:) PTA Ashley, with patient Lori, Technician Shelby and Physical Therapist Gus.